California Modern. Deep and squishy, family-friendly, and très chic you can have it all. 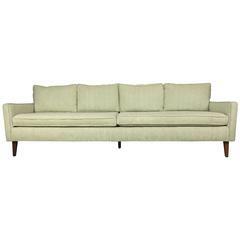 Upholstered in Mulholland Pearl bouclé with minimal brushed brass legs. Combine details like inviting pin-tucked back and side cushions, with removable, dry-cleanable slipcovers and everyone can go mad. Formal, yet informal, our Malibu sofa has the right charisma for a Brooklyn brownstone or Park Avenue penthouse.